APRIL UPDATE: Spring Treadmill Sales Are Now On! See the links below for the best deals. Are you looking for treadmills on sale? Well, you're in luck. Fortunately there are special deals to be found throughout the year, especially online...you just need to know where to find them. Many of the top brands offer discounts off of their MSRP prices at certain times during the year, and not only on holidays. Even the most popular treadmills will be discounted from time to time throughout the year. As a general rule of thumb, the very best sales tend to be in the mid-range category, $1000-$2000. 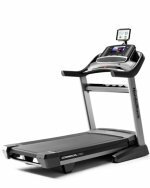 This is the most popular price range for home treadmills, and where you will find the largest selection of models to choose from. The competition is fierce, so there are plenty of deals to be had. That is not to say that you won't find deals at lower or higher price levels. At the lower end, the discounts are not that substantial...the higher-end commercial brands are just not discounted that often. Here are the higher-end treadmills on sale, including top brands Matrix, Life Fitness and Precor. If you're in the market for a commercial grade machine, these three will give you the very best deals. 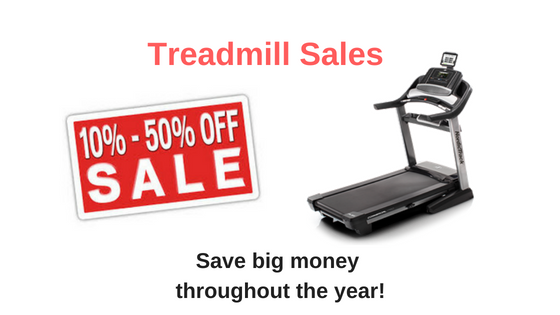 Deals: Use Treadmill Talk exclusive SAVE10NOW coupon code to save 10%! What About a Used Treadmill For Sale? You might be considering a used treadmill for sale by someone you know or someone near you. Perhaps you were thinking of going to eBay, Craigs List, Facebook marketplace or a similar entity. That's definitely another way to save a little money but it's a bit more complicated than you might think. That's why at Treadmill Talk we always recommend you consider buying new on sale rather than buying used, even if you're saving a few hundred dollars. Why is that? Well, for starters, you never really know what you are getting. Of course, if you're buying a used treadmill from a family member or close friend, you can assume that what they are telling you is correct as far as the model, the amount of usage, the pros and cons, etc. But what about when you're looking at a treadmill for sale by someone you don't know, which is much more common? The price might be great, but how do you know if the treadmill will perform? How do you know if it had any mechanical problems or broken components in the past? How do you know how many miles or hours have been logged on the machine? These are all very important questions, and even though you might ask them, you might not get a straight answer from someone who's just trying to make a sale. They can tell you it's never been used and they've had it for a few months. But how can you really tell, unless you're an expert? So our advice is always to look for a treadmill on sale directly from the manufacturer or at a trusted etailer like Amazon, Walmart, Costco, etc. That way you know exactly what you are getting and where it's coming from. It will also have the latest technology, as opposed to the used treadmill you're getting from someone else, and you have plenty of recourse should something go wrong, that you don't have as the non-original owner of a used treadmill you buy on sale. So before you buy used, consider buying new at a discount. The benefits far outweigh the few hundred dollars you may be saving. Treadmills Sales - What's the Bottom Line? Between all of the brands above you can really find a fantastic deal on a new treadmill. Keep in mind that sale amounts vary throughout the year, e.g. you might save a little more during a Black Friday, Cyber Monday or Christmas sale...but generally you'll find one or more models on sale at any given time. So you don't need to wait for the next major holiday to make your purchase. It's a good idea to read our reviews to decide which brand you want to go with, then pick the model that fits your budget and most appeals to you in terms of features and capabilities. Most of the major brands have a variety of different treadmills to choose from, catering to all levels of fitness and workout requirements. Once you know a little bit more about the brand or brands that you like, you can then check our best treadmill list to see which are the top ranked models. Even if you don't see it, doesn't mean it's not a great machine. Most of the time we pick our top three, but your favorite model just might be number 4 or 5. If you need help, you can always ask us and one of our experts will point you in the right direction and help you take advantage of current treadmill sales and find the perfect machine for your home gym.